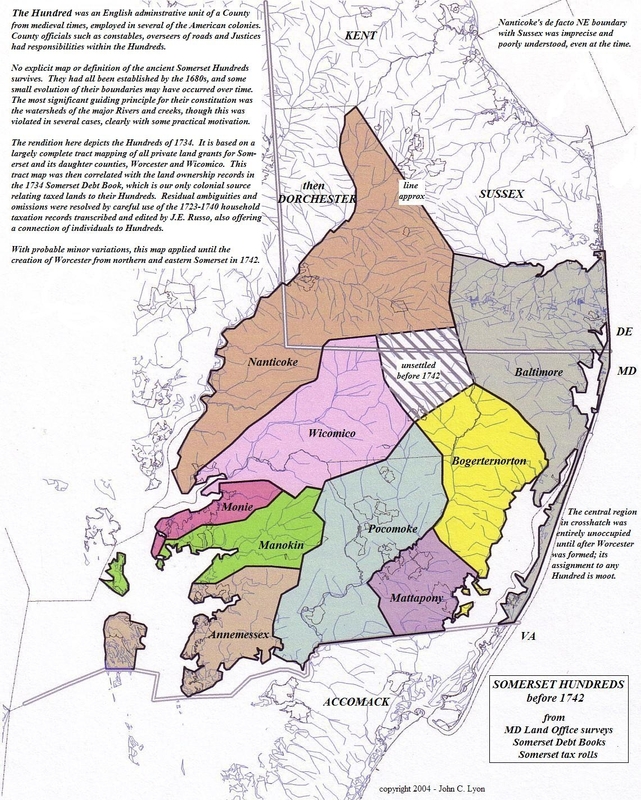 Old Somerset County, Maryland as it looked before 1742 made up of various hundreds (special thanks to my buddy John Lyon for this image). It was formed in 1666 when only a few settlers were in the region. In 1742, it was split north/south down the middle when Worcester County was formed. In 1750, its top was cut off when the Transpeninsular Line was run to define where the Delaware/Maryland border was located. However, it was not till 1774 that Delaware took over administering lands and people north of that line. Finally, in 1867, Wicomico was formed out of Somerset and Worcester. Our ancestors may have lived in Somerset, Worcester and Wicomico (or Sussex in Delaware) over the years and never moved! ENJOY!